Hey, golf nuts, check it out! Discussion in 'The Pub' started by drewbledsoe, Apr 23, 2016. 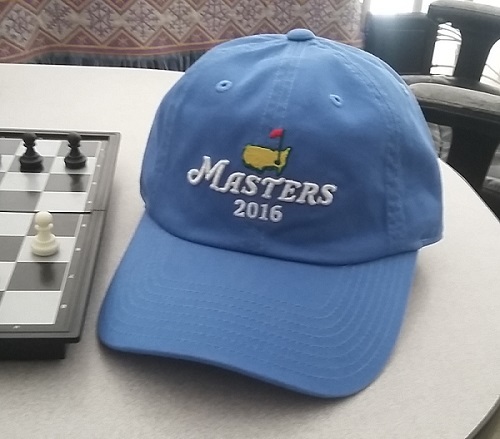 After 16 years waiting in the pool my boss finally got tickets to the Masters. The only place in the world that you can buy Masters "stuff" is in the store at the Augusta course. He said it was the size of a mini-Wall Mart and was packed with dudes spending hundreds of dollars for various souvenirs. He invited me out to lunch yesterday and gave me this. How freaking cool? Your fingers must be very wrinkled. I've been to the Masters and that souvenir shop is insane. I believe it's open for people who get the Tuesday-Wednesday tickets. There are also a lot of corporate tickets for the Masters itself so it is possible to get in there without being part of that age-old list of "patrons." Anyway, it is a madhouse in that shop. Plenty of overseas buyers in there spending thousands. I'm with Mark Twain..... "Golf is a good walk spoiled". This is the worst-looking hat I ever saw. You buy a hat like this, I'll bet you get a free bowl of soup. It looks good on you, though. lp_bruce, rangerkarlos and spyeman like this.